Many will know of Peter Wildoer’s drumming from his audition as Mike Portnoy’s replacement in Dream Theater, James LaBrie’s recent solo albums or his work in Darkane. Peter, who lives just south of Helsingborg, has played drums since his eighth year alive when his quest to master some of the most technically challenging metal started. After a temporary drummer position in Arch Enemy he formed Darkane in 1998 with best friend Christofer Malmström, a melodic death/thrash metal band who has released six albums since, achieved international recognition and toured Europe, USA, Japan and Israel. He has also worked with PC14 artist Lalle Larsson on the insane “Electric Cartoon Music from Hell” by project Electrocution 250. Apart from that, he’s also a drum and math teacher at Mega Musik high school in Helsingborg. In 2010 Peter was asked to drum and sing harsh vocals for James LaBrie’s solo album Static Impulse and made such a good impression that he was among the 7 chosen candidates for filling the empty drum stool of Mike Portnoy – the most prestigious drummer position in the prog metal world! Along with Marco Minnemann (Steven Wilson, Joe Satriani, Adrian Belew trio, UKZ) and Mike Mangini (Steve Vai, Extreme, James LaBrie), he went to the second round of auditions, eliminating Thomas Lang (John Wetton, Robert Fripp), Virgil Donati (Planet X), Aquiles Priester (Angra, Paul Di’Anno) and Derek Roddy. Mike got the job, but Peter has since played the drums for James LaBrie’s recent album Impermanent Resonance. 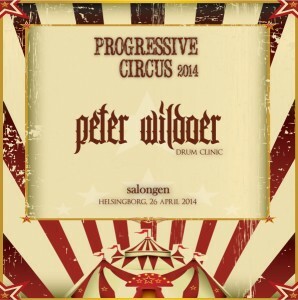 Any drummer with ambitions to develop and improve MUST watch Peter’s drum clinic at Progressive Circus! And to all else: take a chance to witness one of prog metal’s finest instrumentalists in action!